The very basis of state building, historically, has been based on exclusion, both internal and external. In order to form a nation-state, you had to somehow manage a wide variety of different communities, values, ethnicities, religions etc. 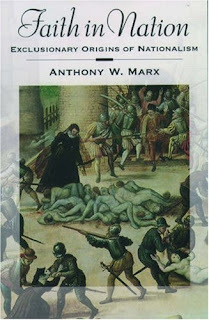 Anthony Marx, in his book Faith in Nation: Exclusionary Origins of Nationalism says, the “’collective solidarity’ of nationalism emerges when a population ‘is perceived as essentially homogenous,’ with any ‘crisis of identity’ thereby resolved” (21). In order to create such homogeneity, certain groups were favored and identified with at the expense, disadvantage, and often oppression, of other groups. When nation states were emerging, they were vulnerable and lacked widespread support. Marx says, “to avoid being disempowered or defeated by those competing groups aligning, the state may forge an alliance with one group, which is solidified by the exclusion of a different group from specified rights and reinforced prejudice of that other…states can solidify their support by transgressing the rights of one group to the advantage of the other group” (22). The ultimate goal of this exclusion was to create mass support for the nation, based on what we are not; based on creating an “other”. Internal discord of competing groups was thus dealt with through selective domestic exclusion. “Demarcating, demonizing, and depriving ‘outsiders’ found within provides a referent that can further unify and solidify the support of the in-group” (23). Elites and/or commoners, eager to build solidarity and cohesion within their group, purposefully magnified even minor differences. “Such exclusion is evident in informal discrimination, state policies of citizenship, forced assimilation, expulsion, or eradication” of that created “other” (24). Thus nationalism has been internally exclusive along existing cleavages of race, gender, ethnicity, class and for our purposes, religion. Marx says, “Religion…was the primary basis of mass belief and solidarity. Faith provided both a template for popular engagement, which state rulers or their opponents sought to emulate in the secular realm” (25). Religion was the perfect rift for nascent nation-states to focus on. Conflict between groups enraged existing religious passions. Religious groups were torn and pulled in varying directions. Fighting for power synchronized faith and politics. Religion became increasingly involved to nation-state building. As religious communities waged war with competing religions, it becomes more than a religious community, it become a political community (26). Excluding others became the basis for increasing cohesion. Resulting cultural identifications then focused on secular obedience, however indirect. Regardless of secular aims, the power remained with religion. Internal exclusion, however, had external consequences. Aggravation with foreign enemies, who formed their nation-states on similar exclusionary practices, was reinforced. External enemies became extensions of the internal heretical traitors. “Repetition of this exclusionary process would and still does feed ongoing antagonisms and conflict” (32). We are of course aware of group identification and in-group/out-group dynamics. However, Marx’s work shows that religion played a central role in the early exclusionary practices of nation-states themselves. As Sam Harris so eloquently said, “religion is one of the great limiters of moral identity, since most believers differentiate themselves, in moral terms, from those who do not share their faith. No other ideology is so eloquent on the subject of what divides one moral community from another” (176).